Home > Blog > Collective Leadership? Posted July 13, 2018 & filed under Blog, Executive Coaching, Top Team Effectiveness. Hearing England Manager Gareth Southgate talk about “the collective” may have had for some echoes of a bygone communist era where the needs of the people were allegedly supplied by selfless collectives toiling in fields and factories. The word is also used as a means of papering over leadership divisions as in “cabinet collective responsibility” and as such in recent times has rather tarnished its meaning. Southgate has found new meaning, and perhaps business leaders could learn from it. For him it’s clearly all about pulling together. Before the current World Cup run many had fallen out of love with our England team seeing them as a bunch of overpaid, ego driven individuals who worried more about the purchase of the latest super car than the team work required to deliver national pride. Of course it’s been tried before with limited success. David Cameron’s, “We’re all in this together,” has a hollow ring to many of those struggling under austerity while those who caused it seemed to continue their gilded lives scot free. So how did the waist-coated wonder make it work? Essentially he realised that although our team is very young they needed to be treated as individuals rather than as a callow bunch of youths to be moulded by a greater mind. Good teachers know this, encouraging individual strengths and building confidence. 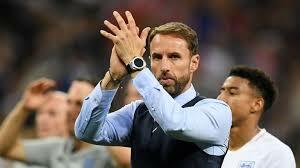 Southgate knows the value of celebrating individual talent and only then inspiring and motivating. Even in defeat he continued the theme. He was obviously disappointed. We all were. But within moments of the final whistle against Croatia he was managing by walking about. A consoling word here, an arm round the shoulder there; for some a hug. The team is still work-in-progress. Southgate has already picked them up and I guess by now they’re back on their collective horse and to a man prepared to walk on burning coals for their manager once again. He, and they, will be back!